Colin Campbell Cooper (1856–1937), Hudson River Waterfront, New York City (c 1921), oil on canvas, 91.4 x 73.7 cm, New York Historical Society, New York, NY. Wikimedia Commons. 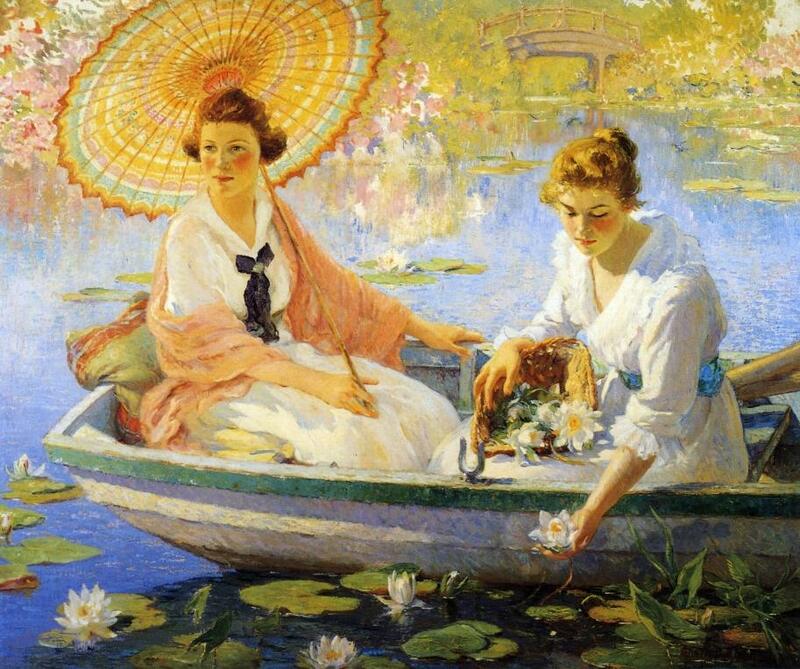 The previous article showed paintings from the early decades of the career of the American Impressionist and master of skyscrapers, Colin Campbell Cooper (1856–1937). In April 1912, he crossed the Atlantic in the liner RMS Carpathia, and happened to be one of the witnesses to its rescue of survivors from the sinking of the Titanic on 15 April 1912. He produced several paintings showing the events, although as they are views showing the ship that he was on, they must have been based on constructed scenes rather than his direct experience. Sadly none is available in an image suitable for display here. In 1913, the Coopers travelled to India, apparently commissioned by a rich woman in the US to paint for her there. They visited, and painted in, India, Palistan, Sri Lanka, and Myanmar. Colin Campbell Cooper (1856–1937), Taj Mahal, Afternoon (c 1913), oil on canvas, 73.7 x 91.4 cm, Private collection. Wikimedia Commons. 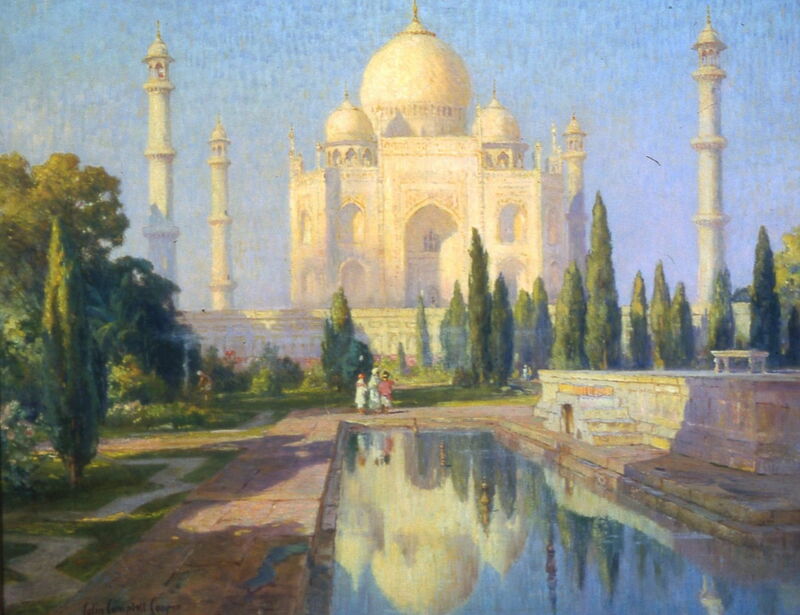 Taj Mahal, Afternoon (c 1913) was probably the best-known painting resulting from that trip, and was exhibited in Rochester, NY, in 1915, on their return. Cooper and his wife, Emma Lampert Cooper, showed an equal number of paintings, but hers seem to have disappeared almost without trace. This white marble mausoleum was built to house the tomb of the Mughal emperor’s favourite wife, Mumtaz Mahal, between 1632-1653. Shown here in warm low-angle light, Cooper deftly avoided the more usual perfectly symmetric view. 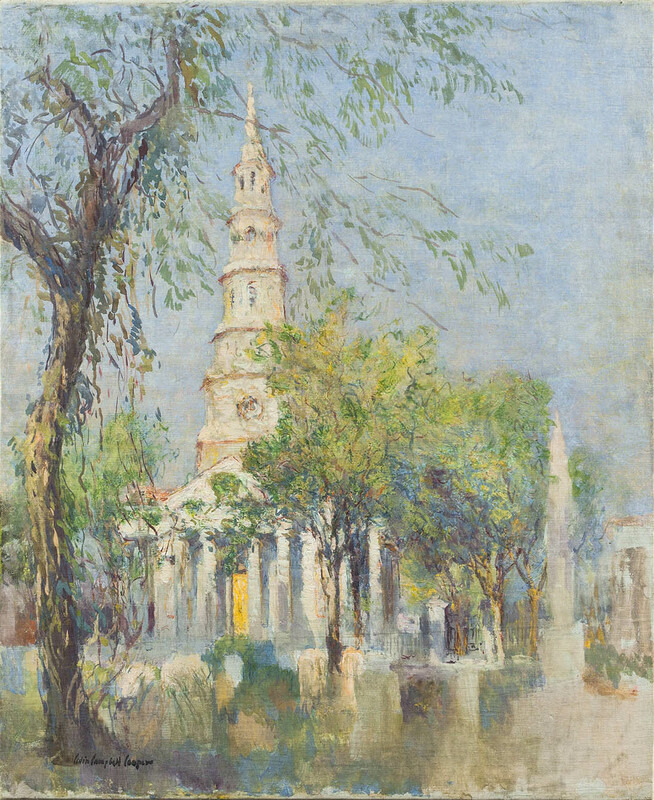 Colin Campbell Cooper (1856–1937), Saint Philip’s Church, Charleston (1913), gouache on canvas, 46.4 x 38.1 cm, Private collection. Wikimedia Commons. Saint Philip’s Church, Charleston (1913) shows this beautiful Episcopal church in South Carolina, amid Cooper’s highly gestural foliage of trees. The church was built in 1835-6 to replace a series of ill-fated wooden buildings. Its spire was completed in 1850, and served as a navigational lighthouse for many years. Although painted in gouache, Cooper has used the medium with a very light and loose touch. In these later paintings, Cooper moved from the solid mass of skyscrapers to greater lightness and greenery. Although one high building is still present in his New York Public Library (c 1915), the street is less densely packed, and the plants and trees brilliant green. In 1915 he exhibited in the Panama-Pacific International Exposition in San Francisco, and fell in love with the West Coast, which completed his transition away from skyscrapers. He and his wife spent the winter of 1915-16 in Los Angeles, and decided to move there permanently. 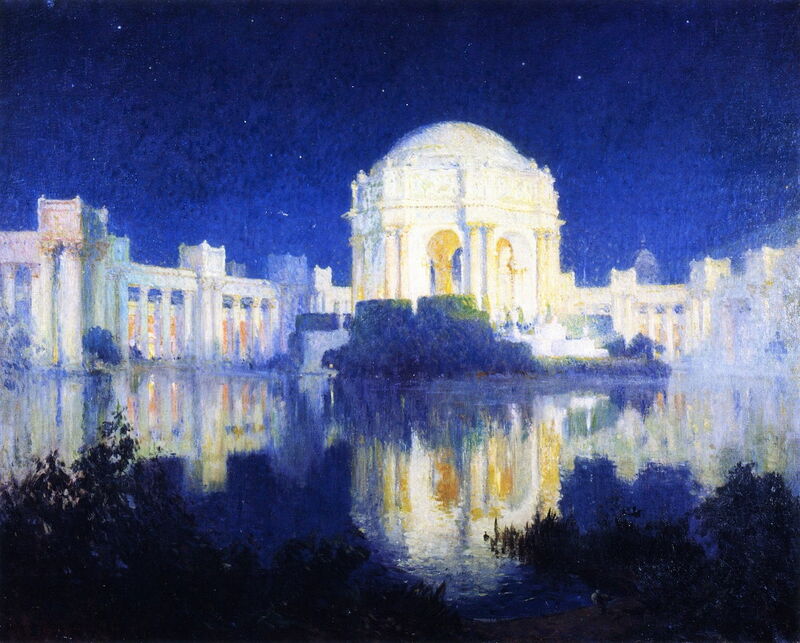 Cooper painted several scenes of that International Exposition, of which the most spectacular is that of the Palace of Fine Arts, San Francisco (c 1916), seen on a cloudless night. It is perhaps a shame that he did not paint more nocturnes. Summer (1918) appears to have been inspired by Japonism, which was far stronger on the West Coast, of course, and Claude Monet’s paintings from his garden at Giverny. Although Cooper painted some fine portraits, once set in a landscape I think that his figures have a slight awkwardness to them. This is most marked in the right hand of the figure on the right, perhaps. Cooper moved to Santa Barbara, CA, in 1921, following his wife’s death, and he became Dean of Painting at Santa Barbara Community School of Arts. He maintained his studio in New York until 1931, though. Colin Campbell Cooper (1856–1937), Fortune Teller (1921), oil on canvas, 116.8 x 92.1 cm, Private collection. Wikimedia Commons. 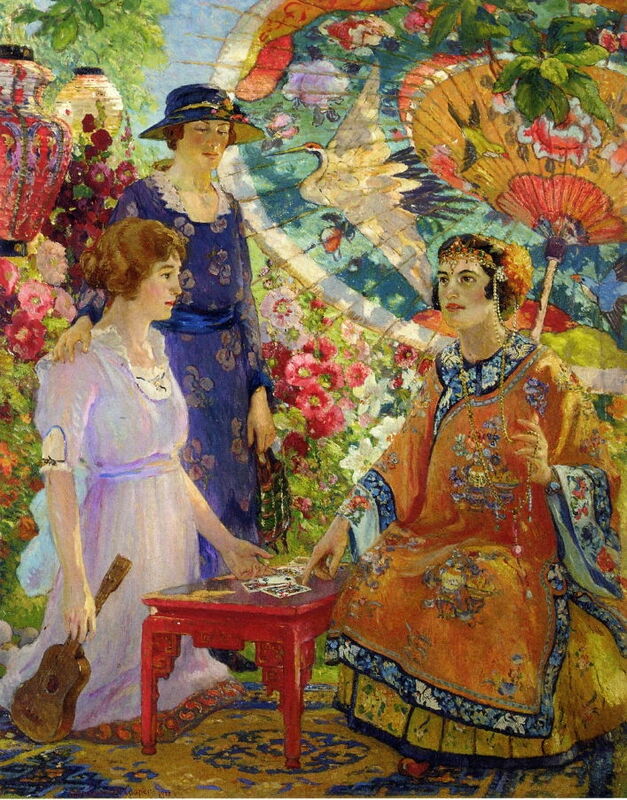 Fortune Teller (1921) is another brilliant study in colour, light, and East Asian influence, although it is something of a mystery that the woman at the left, whose fortune is being told, is holding a ukulele in her right hand. Unfortunately ukuleles have not yet gained entries in dictionaries of symbols in art! 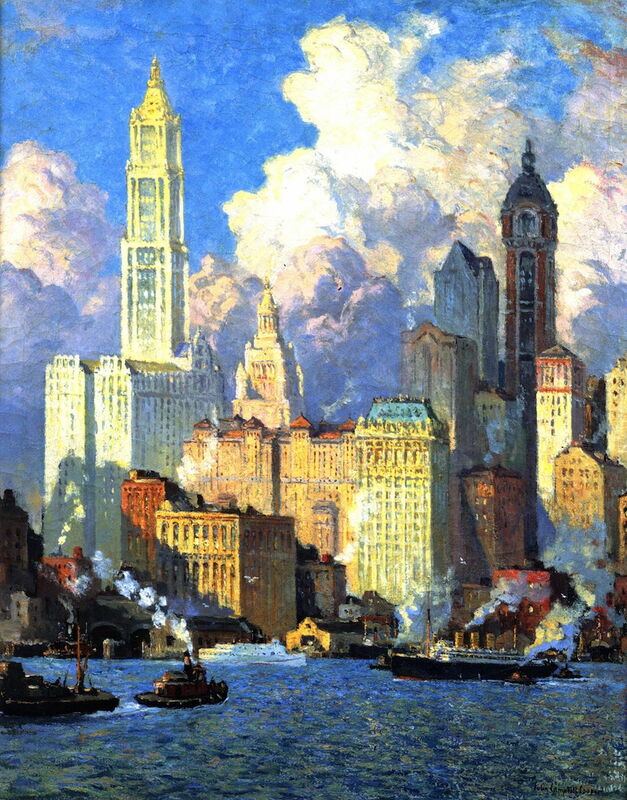 Cooper still apparently craved the occasional skyscraper, and must have painted Hudson River Waterfront, New York City (c 1921) when he was back in his East Coast studio. The highlit and tallest building on the left is the Woolworth Building, completed in 1913, and until 1930 the tallest building in the world, at 241.4 metres. But here the clouds are also built up high, and rise to belittle human structures. Colin Campbell Cooper (1856–1937), Pergola at the Hotel Samarkand, Santa Barbara (c 1921), oil on canvas, 73.7 x 91.4 cm, Private collection. Wikimedia Commons. 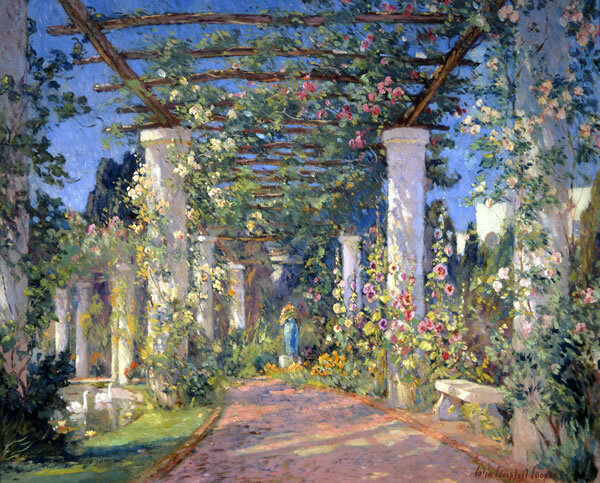 Back on the West Coast, Cooper completed some exquisite paintings of the lush vegetation in California, such as his Pergola at the Hotel Samarkand, Santa Barbara (c 1921). This hotel, most correctly named The Samarkand Persian Hotel, offered the height of luxury when it opened in 1920, in the buildings of what had been a boys’ school. Although it closed in 1940, the name lives on as one of Santa Barbara’s neighbourhoods. Colin Campbell Cooper (1856–1937), Terrace at Samarkand Hotel, Santa Barbara, California (c 1923), oil on canvas, 35.6 x 50.8 cm, location not known. Wikimedia Commons. 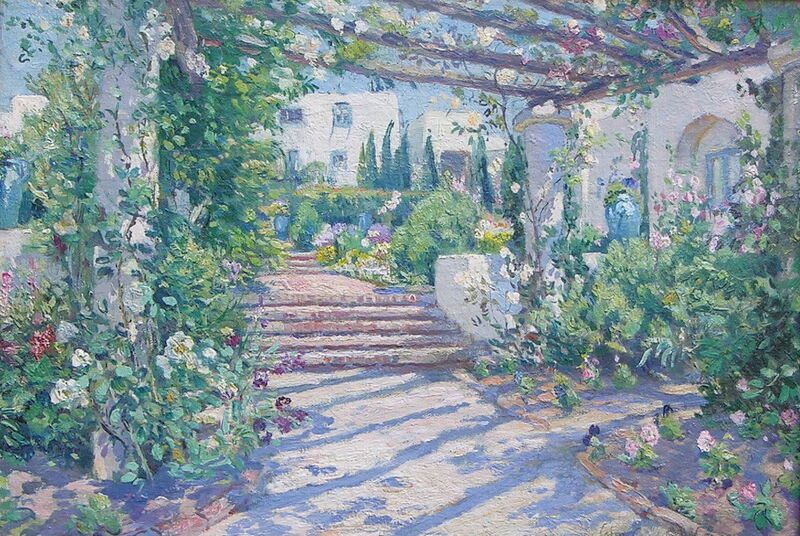 Terrace at Samarkand Hotel, Santa Barbara, California (c 1923) shows Cooper’s sustained Impressionist style. However, in the 1930s, Cooper’s failing eyesight limited his painting during those final years. Since his death in 1937, his works have been exhibited frequently throughout the USA, but as far as I can discover no exhibition has ever travelled to Europe, and very few of his paintings have entered major European collections. 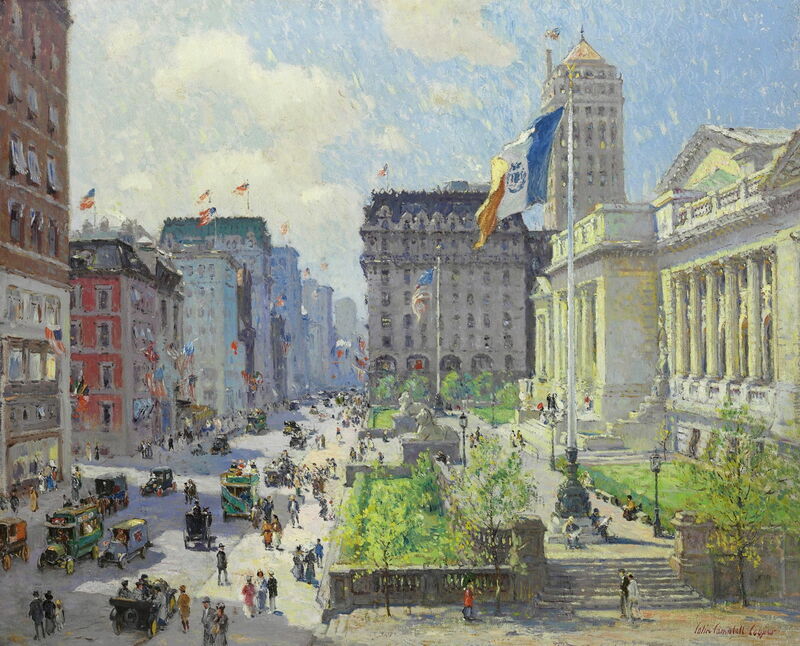 Surely, just as Pissarro and other French Impressionists gave us visions of Haussmann’s renovated Paris, so Cooper painted impressions of the growth of New York City in the vertical dimension, which have influenced painters, photographers, and cinematographers ever since: Colin Campbell Cooper, Master of the Skyscraper. Posted in General, Painting and tagged America, cityscape, Cooper, Impressionism, Lampert, skyscraper, Titanic. Bookmark the permalink.